Promote4you: TaxMampa Just do it! Hire an Expert! TaxMampa, a photo by totemtoeren on Flickr. 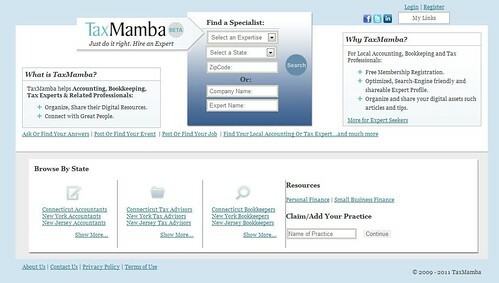 TaxMamba( Beta version) is a SaaS platform of a NYC based Technology Marketing MLFSolutions. It is an online platform that introduces Smart Local Financial Service Providers (particularly Tax & Accounting Experts to Great people. TaxMamba has a team of very experience professionals from the Technology and Marketing Industry that want to help their communities by staying fun and innovative. TaxMamba is formed because this is our passion and we know that the business of our customer will benefit from our Experience, Creativity and Vision.